Eden, a modern woman desperate to conceive a child with her husband, moves to an old house in the suburbs and discovers a porcelain head hidden in the root cellar—the remains of an Underground Railroad doll with an extraordinary past of secret messages, danger and deliverance. Ingeniously plotted to a riveting end, Sarah and Eden’s woven lives connect the past to the present, forcing each of them to define courage, family, love, and legacy in a new way. 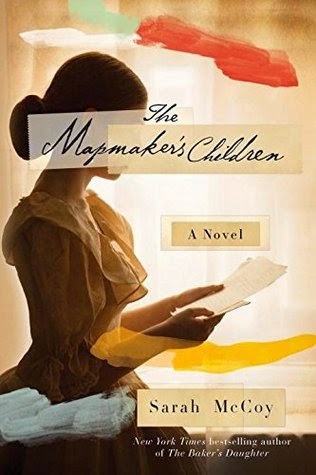 I admit I was a little gun shy about reading The Mapmaker's Children given how much I loved and connected with The Baker's Daughter. I have been in the position before where I loved a book so much, only to be disappointed by the author's other work. Maybe it's too high expectations. I don't know. What I do know is that I'm not quite sure which book I liked more, The Mapmaker's Children or The Baker's Daughter. I can think of a couple of people at least who will be getting this book for their birthdays this year. When reading a dual time period novel, I often am more drawn to the historical story than I am the contemporary one. I am not sure exactly why that is, but it happens often enough that I almost consider it a given. In The Mapmaker's Children, I was pulled into both stories equally and I found myself feeling a little frustrated at having to leave one time period for the other--I was never quite ready to leave Eden's or Sarah's presence, depending on who I was with at the time. I say this as a compliment, really. I was invested in both characters' stories and wanted to continue on with each one. It took me a little while to warm up to Eden even so. The more I got to know her and her situation, the more I began to understand her. I know what it is like to want to have a child--the pressures and stresses that can come with trying. The waiting and hoping. Followed by the disappointments. It consumes you, and it takes its toll on you. I eventually was able to have a child, but not everyone who wants to is as lucky. Eden wants so badly to have a child, has had miscarriages, and all the efforts she and her husband have tried have so far failed. She isn't sure who she is anymore; her relationship with her husband is strained. She's not sure she can salvage it. She is in a dark place emotionally. She feels angry, lost and disconnected--purposeless really. I felt those things along side her, and my heart soared as she began to come out of her depression to reconnect with others and rediscover herself. Sarah Brown, in her own time period, is quick to substitute her inability to have children with action, taking an active role in the abolitionist movement and helping with the Underground Railroad. She feels very strongly about ending slavery. She's resilient and strong, a very capable woman. She is ever practical minded, something I admired her for but also gave me cause to feel sorry for her. I wanted so much for her to find the happiness she deserved. There's a lot I wish I could say about Sarah. I was awed by her character. She truly was an extraordinary woman, both the fictional version McCoy has created and the real life woman. I don't want to spoil her story for you, however. McCoy doesn't skirt around the issue of how painful war can be. She captures well the tension in the year leading up to the Civil War and the devastation it caused, not only to the land, but to families and individuals as well. I admit to not remembering much about John Brown, Sarah's father, from my studies of the Civil War, but McCoy's book has inspired me to seek out more about Sarah and her father. I have always found myself more drawn to World War I and II, but I think I will delve more deeply into the Civil War--there are many stories worth reading and remembering. I have always been interested in the Underground Railroad, but had never really thought much about the amount of detail and work that went into making it work--the maps, the people who made it possible, and those who had to go into hiding to make their way to freedom. Such stories are inspiring, sad, and a core part of American history I hope we never forget and never experience again. The minor characters in The Mapmaker's Children were no less compelling than the two protagonists. How I loved Jack, Eden's husband, and Freddy, Sarah's friend and confidant! I liked Alice and Siby, especially Siby's loyalty to the Hill family even when things became very dangerous for her in the South. I adored Cleo, a young girl hired to walk and feed Eden and Jack's dog, Cricket. She is a girl after my own heart--industrious and thoughtful. She loves a good mystery, just as I always have. And Cricket and Gypsy. They would make anyone's heart melt. Dogs often do. There is so much I want to say about this book, and yet I find myself not sure how to put it into words. The author is such a good story teller. She has a gift for weaving together history with the present in such a way as to make them seem so different, and yet, by the end, you can't help but look back and see how everything, including the characters, were connected, and appreciate the book even more. I was touched by the characters and moved by their stories. I didn't want either of their stories to end. Even now, days after finishing the book, I am still thinking about both Eden and Sarah. Oh my goodness, how I loved this book with all the emotional ups and downs! My heart broke and my heart sang. I wish I could hug the characters and move to New Charlestown right now. To learn more about Sarah McCoy and her books, please visit the author's website or her blog. I hope you will check out what others had to say about The Mapmaker's Children on the TLC Book Tours route! Many thanks to the TLC Book Tours for the opportunity to be a part of this book tour. Copy of book purchased by myself. Great review, Wendy! I enjoyed reading your thoughts and it sounds like this book is an emotional-filled as well as a character-driven story. And I like reading books like that. Will have to add them to my wishlist! Melody - Thank you. I do hope you will read this one! I think you would like it, Melody. What a lovely review! I can tell this book really spoke to you. Kathy - Thank you! Yes, it really did. I love books that speak to me in such a way. What a lovely review, Wendy! I almost felt I'd read the book. If you are thinking of reading other books that are set in dual timer periods with the Civil War time as part of it, might I suggest you take a look at Jennifer Chiaverini's books. Hers is a series that has quilts as a connecting feature. Some are contemporary, but a lot of them have a dual setting that is historical and then present day. Several talk about the Civil War time and the Underground Railroad and how quilts were used. Check it out! Kay - Thank you. I probably did give too much away. :-) Thank you for the recommendation of Jennifer Chiaverini. I will definitely check her books out. This does sound good though a bit of an emotionally tough read. I've been wanting to give a try and your review has it firmly on my TBR. Like you I tend to be drawn more to this historical time periods so it's good to see that the contemporary story is as compelling as the historical. Katherine - I hope you do give this one a try, Katherine. Many of the reviews I am reading favor the historical time period in this one, so you may too. It is a pretty extraordinary story. I'd love to read your thoughts on this if you do read it. I've read so much that is positive about this author that I must find her books. Great review. Mystica - Thank you. :-)I highly recommend her books! This sounds wonderful. I will add it and The Baker's Daughter to my list. Irene - Books like this always make me wonder why I do not read historical fiction more often. I hope you are able to read this one or The Baker's Daughter at some point. I've been hearing such great things about this book. I definitely need to add this to my TBR! I'm so pleased that this book more than exceeded your expectations! Thanks for being a part of the tour. Loving the title, the cover not so much. Interested by the whole abolitionist thing I'll be sure to keep a look out for this. Tracy - Thank you. I didn't expect to write so much when I sat down to write this review. If you do give it a try, I hope you will like it. As you know I really loved this book as well. ; McCoy is such a great writer and her ability to weave stories that capture a reader's attention amazes me. Like you I liked Eden. I've read many reviews of people who hated her but you know I felt for her and I can only imagine that you would have even more given your past. I just felt that she had been through so much and having been disappointed that many times would be enough to make anyone extra miserable. Yet by the end of the book she was growing as a person and moving on. Ultimately I guess we now find ourselves wishing that Sarah had another book coming out and soon! Darlene - I just love McCoy's books. I need to read her first book. I probably read those same reviews about Eden. She's in such a bad place . . . As I mentioned to you via e-mail, I wasn't sure about her at first, but I was better able to identify with her as the story went along. I would love to know more about Sarah. What an amazing woman! Jenclair - I hope you like it when you get to it, Jenclair! Wow, such a fabulous review!! I haven't read anything my McCoy - I wasn't sure her books were for me, but this one sounds so good that I have to pick it up. Thanks for reviewing this one. Athira - I have really enjoyed the two books I have read by her. I hope you will give her a try. What a wonderful review! I do enjoy books that go back and forth in time but usually I like one period over another. It is impressive indeed that this author made you equally invested in both story lines! Definitely adding this one to my list. Iliana - Thank you! It does seem like one story stands out above the other in dual time period books, doesn't it? Great and informative review! I read The Baker's Daughter by same author last year and gave it 5/5 stars. Now I see she has come back with another title that will be just as good a read for me--yay! Can't wait to read it now. Lindsay - Thank you. :-) I never really have that problem with series books--maybe because I know about what the expect. But with fiction novels, I get a little anxious when beginning a book by an author whose work I really enjoyed before. I'm glad this one turned out just as good! Glad to see you loved it as much as I did! Anna - I love Sarah McCoy. She's definitely earned a spot on my favorite author list. Great review! I also enjoy dual time fiction, and I'm also usually drawn more to the historical time period than to the contemporary one. I'm going to add this book to my list. Thanks! A.M.B. - Thank you! I hope you enjoy this one if you do read it. Sarah is worth getting to know. Both of her novels sound lovely! I'll have to be on the lookout at the library. Shaina - I hope you do get a chance to read them!